The HyperStar 14 system allows extremely fast, wide-field CCD imaging with the Celestron 14" SCT. The lens replaces the secondary mirror on Fastar-compatible 14" SCTs and turns the telescope into an f/1.9 imaging system! The HyperStar 14 is compatible with a variety of cameras, including Canon and Nikon DLSRs, SBIG ST-7/8/9/10/2000 series, and cameras from Starlight Xpress, SAC, Orion, Meade, and the popular StellaCam video system from Astrovid. Celestron has shipped some non-Edge HD telescopes with the Edge HD rear cell. 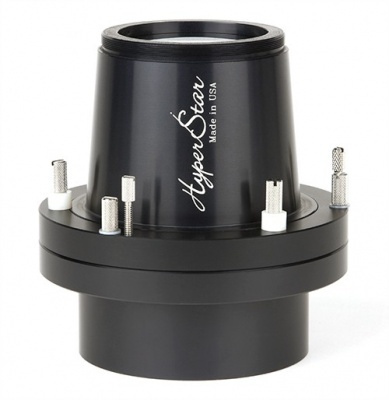 Because this cell moves the primary mirror forward, the Edge HD version of the HyperStar lens is required. If unsure which model to order, please give us a call. Length (without camera adapter): 5.1"